A Fairy Tale Part II - Cure a Queen is the penultimate installment in the fairy quest series and revolves around the Fairy Godfather. The objective of the quest is to finally cure the Fairy Queen and prepare the retaliation against the Fairy Mafia. You do not need to meet any of the skill requirements to use the fairy rings; you only need to complete a part of the quest to obtain permission to use them. The Godfather attacked us. We have fled to safety. If you are loyal to her majesty, find us by using the co-ordinates "AIR", "DLR", "DJQ", "AJS". After talking to the co-ordinator and being informed of the vast history of the fairy rings and the queen, head south-west to the fountains, where you should see a fairy ring. Talk to Fairy Fixit there, and then try and use the fairy rings while wielding a dramen staff or lunar staff. 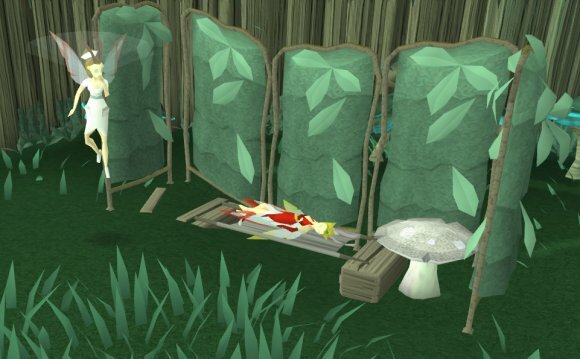 You may now use the fairy rings throughout RuneScape without finishing the quest, if you'd prefer. See our guide for all the possible combinations. You won't be able to travel back to the hideout by using A•J•S, but the steps will be saved in your travel log. Therefore, if you've kept Nuff's Certificate with you, you may simply select "Fairy Resistance HQ" from the travel log and press "teleport" to take you there, without having to travel to all the other three locations again. If you bank Nuff's certificate, the travel log will make you go through all the steps again. The travel log might also be reset by using the fairy rings to other locations or logout or simply over time. The good thing is if you have traveled to the hideout once, you will have the record near the bottom of the log and can use that for travelling to each step. As you complete steps, the highlighted code in the hideout sequence shows where you will go next. Creating the potion before Fairy Nuff prompts you to will make said potion useless, and unable to cure the queen, thus forcing you to remake the potion from scratch.